Shangri-La Plaza welcomes the Chinese New Year with a lineup of exciting events and activities. Ushering in the Year of the Pig, the metro’s leading lifestyle destination is fully decked out for the celebrations with rows of gigantic red lanterns, and even a special lantern tree park, symbolizing prosperity and good fortune. The Chinese Spring Film Festival runs from today until Feb. 5 at the new Red Carpet Cinemas. 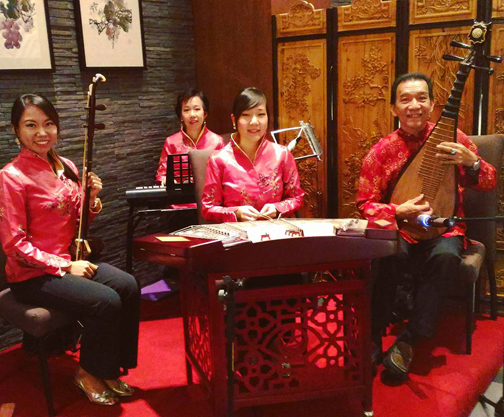 The Kim Hwa Chinese Ensemble’s captivating performance kicked things off as they played their contemporary repertoire on traditional Chinese musical instruments on Jan. 27 at the Grand Atrium. The Chinese Spring Film Festival runs from today until Feb. 5 at the new Red Carpet Cinemas. From wartime romance A Tale of Three Cities to gripping thriller Lost in White, mall guests have free access to the best of Chinese film. On Feb. 2, catch the highly-anticipated Chinese New Year Fireworks Show at 8:00 p.m.. A dragon eye-dotting ceremony and ceremonial blessing will be held, along with a lively dragon and lion dance. The Chinese Painting Workshop is back on Feb. 3, from 2:00 to 4:00 p.m. at the Grand Atrium. Master Fidel Sarmiento and Roger Santos of the Art Association of the Philippines once again conduct their popular demonstration and workshop for those interested to dabble in the delicate art. Witness the vibrancy of the Dragon & Lion Dance Exhibition by the Philippine Ling Nam Athletic Federation on Feb. 10 at 2:00 p.m. at the Grand Atrium. No Chinese New Year is complete without this traditional demonstration, believed to bring good fortune for all who watch. The Chinese Bazaar is the place to be for traditional Chinese items and delicious food from Feb. 1 to 10 at the Grand Atrium. It’s a part of the festivities mall guests shouldn’t miss out on. Revel in the Chinese New Year celebrations with family and friends. #FeelTheShangVibe as the Year of the Pig is warmly welcomed at Shangri-La Plaza.